Patients with acute myeloid leukemia (AML), an aggressive cancer of the blood, often are treated with stem cell transplantation, in which a compatible donor's blood-forming cells are transplanted into a patient. The donor's immune cells then attack and kill the leukemia cells. But even if this treatment initially is successful, many patients experience a recurrence of the leukemia after transplantation that often proves fatal. But the researchers found a significant difference in the cells' patterns of gene expression, that is which genes are active and to what degree. The cells from patients who relapsed after transplant often had greatly reduced expression of genes that were involved with the recognition of cancer cells by the immune system. In other words, when the cancer came back in these patients, it returned in a kind of stealth mode. These stealth leukemia cells lacked proteins that the donor's T cells use to identify them. When the donor's immune cells can no longer detect the leukemia cells, the T cells fail to destroy them. "We were surprised by these findings because we and others had previously studied samples of relapsed leukemia in every which way," said senior author John F. DiPersio, MD, PhD, the Virginia E. and Sam J. Golman Professor of Medicine in Oncology and director of the Division of Oncology at the School of Medicine. "But there's a rational explanation, since the way stem cell transplants attack leukemia — through an immunologic mechanism — is going to favor the survival of cancer cells that become invisible to the immune system." 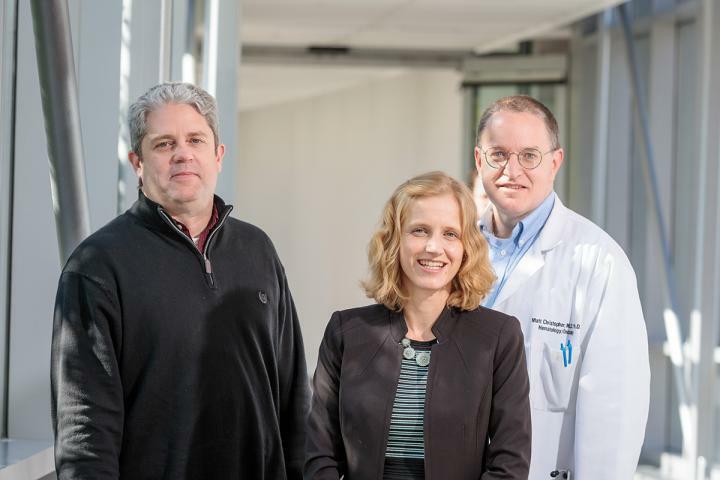 The researchers found that the relapsed cancer cells did not have recurring genetic mutations that caused them to go into stealth mode by disabling the genes that control immune recognition. Rather, the cells possessed something like a "dimmer switch," dialing down the expression of immune markers. And dimmer switches, unlike mistakes in DNA, are often easier to adjust. An immune signaling molecule called interferon gamma has long been known to dial up the body's natural immune defenses. Indeed, interferon gamma is vital to the body's response to infection, and is widely known for its ability to increase expression of the immune markers that these stealth cancer cells have hidden away. "When we treated leukemia cells from patients' relapse with interferon gamma, it turned back on those immune markers that had become invisible, suggesting that this process is reversible," said Christopher, who also treats patients at Siteman Cancer Center. This work was supported by the National Cancer Institute (NCI), including the "Genomics of AML" Program Project Grant (P01CA101937), additional NCI grants (K12CA167540, R50CA211466, R35CA197561 and P50CA171963), and by The Foundation for Barnes-Jewish Hospital. Christopher MJ, Petti AA, Rettig MP, et al. Immune escape of relapsed AML cells after allogeneic transplantation. The New England Journal of Medicine. Oct. 31, 2018.